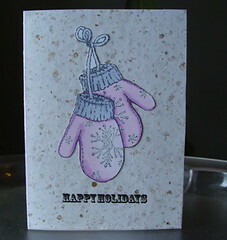 Simple mittens coloured with Copics, then mounted on mica-flecked handmade paper. I love the simplicity of this card. And I LOVE this stamp. I went over the snowflakes on this one with white opaque pen. 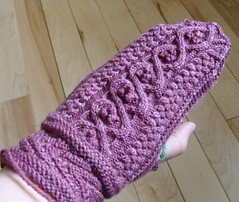 I have a pair of these mittens (in green) on the front of what I’m calling my ‘idea book’. Really, it’s where I stick my practice colouring pieces, and eventually any other inspiring things or ideas written down. I’m excited to add to the cover over time, until the entire black cardboard cover has disappeared. I just want to say that I have a ‘thing’ about mittens. 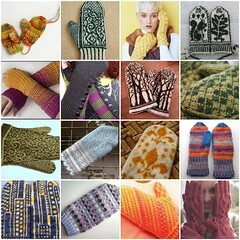 I just checked my Ravelry queue, and I have 16 mitten patterns in line. The one pictured is too small. I have up to the thumb of a new, larger one. Last night a fell asleep picturing a mitten display – a board that hangs on the wall, with clothespegs or something to hang up all my mittens – one for each day of the week! If I want to see that though, I’m going to have to get knitting! This entry was posted in Hand Warmers, Papercrafts by rycrafty. Bookmark the permalink. lol…I think the reason why I’ve stuck to socks & avoided mittens is precisely because they look to be the kind of thing one could get addicted to very easily! I get addicted, I line up all sorts of patterns, but I don’t knit them. Or I haven’t yet. The one pair of mittens I have on the needles have been languishing for almost a year. I just dream of mittens.